The simple answer is to look at any gossip magazine! Along with stories about failed relationships, cheating and who’s lost weight on what diet, dodgy hair extensions feature regularly as a key reason for calling out celebrities who look less than great. The list of those who’ve been charged with ugly hair extensions includes: Demi Moore, Pamela Anderson, Beyoncé (remember those super-long, rather ratlike braid extensions she had?) and even the usually immaculate Victoria Beckham. 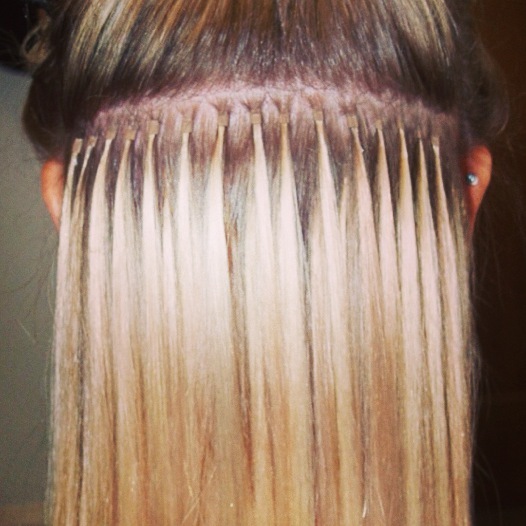 While you may not end up on the front page of Hello Magazine, poorly applied extensions can definitely leave you as the centre of attention for all the wrong reasons. Because you want longer/thicker hair than is naturally possible. If you’re having hair extensions for your wedding, it’s really vital that you work with a professional hair and make-up artist who can ensure your extensions blend naturally into your hair and that they are properly positioned to be invisible for your wedding hairstyle. There’s nothing uglier than obvious extension bonds around the hairline when your hair is in an up-do. Trying out a new look is a great idea, but if you don’t have professionally placed hair extensions, you won’t be able to tell if your possible new look will work for you or not. For those planning to have regular extensions to give them longer or thicker hair, a professional hair stylist is essential because prolonged use of extensions can damage natural hair, which can lead to further breakage or thinning – exactly the opposite of what you’re seeking! A heat clamp melts the solution, sealing the extension around the real hair. Damage – it’s really easy to damage not just the hair but also the scalp, both with the bonding solution and with the heat clamp. Professionally applied extensions can be expected to last up to four months, after which the bond solution begins to break down and the attachment will begin to slide off. Two reasons that home applied extensions have a shorter life are (a) overuse of bonding solution, which can burn hair and cause split ends and (b) failure to apply hair extensions evenly, which can lead to the weight of the extensions pulling on and quickly breaking natural hair, so the bond snaps and the extension falls out. It’s not just applying hair extensions that is best done by a professional – careful and expert removal preserves the condition of your own hair, so that a minimum of damage is done when the hair extensions are finally removed.